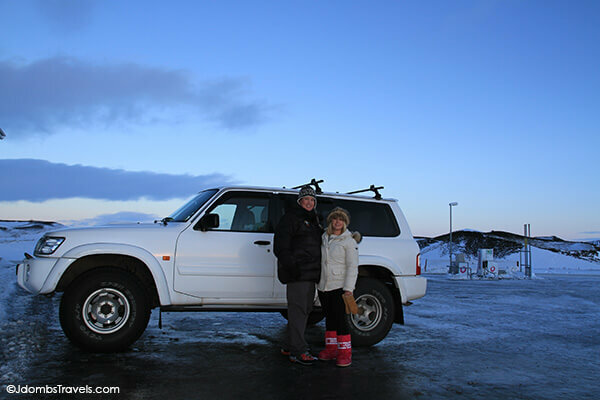 We spent three nights staying in Lake Mývatn and were thrilled to take a Super Jeep tour with Saga Travel. They are a family company with local guides that know the lay of the land. Our guide, Ólafur, picked us up at our cabin and it was immediately evident that he knew Lake Mývatn like the back of his hand. Ólafur lives in the area where he honey bee farms and was even of relation to the family that owns Vogafjós Guesthouse where we were staying. Ólafur was a fantastic guide and we learned a lot, even the location of a secret geothermal spring, on our Lake Mývatn Super Jeep tour. As we skirted along the east side of the lake, craters in all sizes began to pop up. These are the pseudo craters of Skútustaðagígar and our first stop of the day. The Skútustaðagígar pseudo craters were formed by gas explosions when boiling lava overflowed the wetlands. If you were to visit in summer, the wetlands are a protected area and so to preserve the delicate land, you must stick to a path. In winter, the wetlands are frozen over and snow covered, so we were free to climb up to the top of the craters and run freely over the snow between! Ólafur gave us time to explore on our own and we literally had the craters to ourselves. It was fantastic as we watched the sun peek over the horizon and glitter on the icy snow. After a quick lunch at the Sel Hotel, we continued on to Dimmuborgir, literally translated to “dark cities”. It’s a lava field of unusually shaped pillars and Ólafur had an explanation. In Iceland, most Icelanders believe in trolls and elves. So it should have been no surprise that Ólafur’s explanation was that a couple of trolls living in the area decided to have a big party during the dark period and invite all the other trolls. Apparently, trolls and sunlight don’t get along. The trolls had partied so much and for so long, that they forgot the sun would shine again. It is said that the unusual lava pillars are really trolls that turned to stone when the sun came up. A more scientific explanation is that a lava tube formed a lava lake flowing in from the eruption at the Þrengslaborgir and Lúdentsborgir craters around 2300 years ago. The top crust collapsed and the lava lake drained, leaving behind the lava pillars. No matter which explanation you believe, if you are a Game of Thrones fan you’ll be seeing more of this landscape. Game of Thrones was filming recently in Dimmuborgir and several other locations around Lake Mývatn and we hear the show will air in the US on March 31. 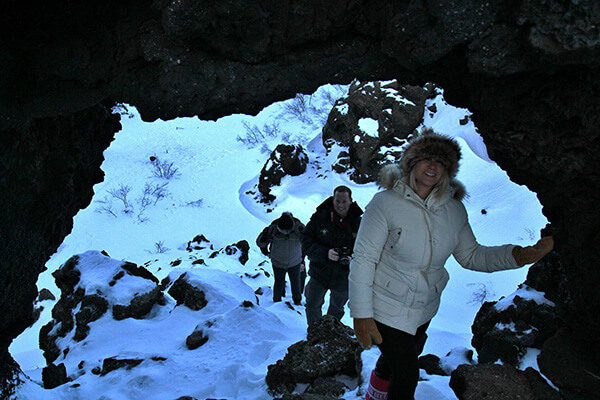 There are a number of walking paths at Dimmuborgir of all lengths and levels of difficulty. The Little Circle walk takes only 15 – 20 minutes and the Big Circle 30 minutes. Krókastígur, the Crooked Path, is a little more demanding walk which takes around 40 minutes. Like Skútustaðagígar because the snow covered the lava formations, we were able to climb up into one of the arch opening for a truly spectacular view over the area! And again, our little group of five had Dimmuborgir entirely to ourselves (unless you consider the elves hiding about). Can you spot the Rock Ptarmigan? 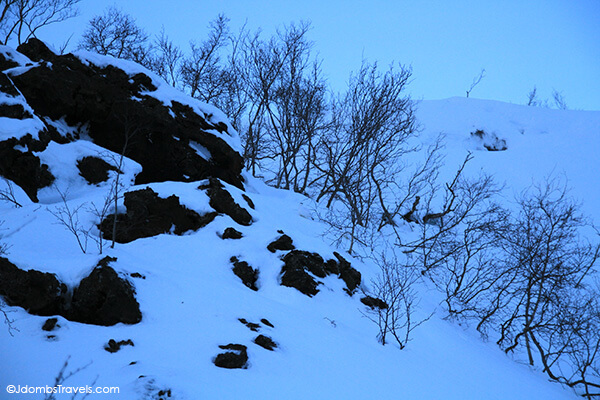 As we were walking out of Dimmuborgir, several Rock Ptarmigan (a game bird in the grouse family) decided to come out. In winter, their feather moult from brown to white in order to disguise them from polar fox. Ólafur made us laugh because there is a short period before Christmas when Icelanders can hunt Rock Ptarmigan and it is a typical dish to be served for Christmas dinner. He was only able to hunt two during the season and now here were at least five all mocking him. Next we stopped at Grjótagjá, the rift between the the American and the Eurasian tectonic plates which are drifting apart. There are two caves with natural geothermal springs inside. The water in the man’s cave is 45°C and the water in the woman’s cave is 42-43°C. Ólafur still starts every single day with a bath in the woman’s cave and since we were staying nearby, encouraged us to come back and give it a try. We did the next night. The sun set and as we entered the blue period, we wandered the fumarole field Hverir. These are are openings in the earth’s crust through which sulfurous vapors rise up. Bubbling mud pots are tinged with sulfur crystals and the ground is a rainbow of colors from bright yellows to deep reds. A walking path took us around and quite close to the bubbling pools. The steam escaping the fumaroles is around 200°C and comes from cold ground water seeping into magma intrusions. With limited hours of daylight in Iceland in the winter, evenings in North Iceland can seem long, especially when waiting for optimal Northern Lights viewing. One evening, we whiled away a few hours relaxing in the steamy aqua waters of the Mývatn Nature Baths. Similar in concept to the Blue Lagoon, one of Iceland’s biggest tourist attractions, the Mývatn Nature Baths are a man-made lagoon in the middle of a lava field with water supplies running straight from the National Power Company’s 2500 meter deep borehole in Bjarnarflag. Though in winter we were surrounded by snow and sparkling frost, the water is a warm 36° – 40° Celsius and rich in minerals and silicates. North Iceland isn’t visited by many tourists in the winter (though they boast that you have a 50% better chance of seeing the Northern Lights in the North) and so we practically had the Mývatn Nature Baths to ourselves. We soaked in the lagoon, moving around to find the various spurts of a hot water throughout the lagoon. It was only slightly cloudy and I hoped the Aurora Borealis would make an early appearance to dance above us. A house with two steam baths is built straight on top of a geothermal area and the sulphur-free steam rises up through holes in the floor. Not wanting to leave the therapeutic waters of the lagoon, I let Tim try out the steam baths on his own. It was a heavenly way to spend a few hours and we were going to return again the next night until we decided to be a bit more adventurous with our bathing. Nearby is Grjótagjá Thermal Spring inside of a natural lava cave, where many locals go for their daily bath. Give them both a try for two entirely different experiences. Mývatn Nature Baths off-season and shoulder season entry is 2800 ISK per adult (approximately $22). In winter, Mývatn Nature Baths are open daily from 12pm – 10pm and the last entry is at 9:30pm. Bring a bathing suit and towel. Towel rental is also available for 600 ISK (approximately $4). Thank you to Saga Travel for hosting us and thank you to Ólafur for all the fantastic information! As always, all opinions are our own. The Ptarmigan is almost in the center of the photo just to the left the brush line. Very cool country for hiking. Yes, that’s exactly where it is! They are very pretty birds. We saw quite a few in the north over our couple days there. Looks incredible, I especially love the lava and that you had the place to yourself – the ultimate getaway! Our guides told us that over 3 months in the summer, approximately 300,000 people visit the pseudo craters and the lava field. We imagine it would be packed. So we were incredibly appreciative to see it in this different perspective and be the only ones there. This looks like great fun and I love the lighting. Thanks, Leigh! The photos are all unedited. The blue light period makes for some beautiful color…and really hard to edit photos. Volcanoes are so fascinating. We haven’t been to South America yet, but I would love to see some of the ones there. I’m also really interested in hiking the active volcano Stromboli in Southern Italy this year. Absolutely stunning photos! I can’t wait to travel to Iceland and will definitely have to look into the Saga Travels tour! Thanks! Saga Travel was so great because their guides are from the local area and can really show you some secret spots and are so knowledgable! Thanks, Andrea! Lake Mývatn was beautiful and we saw the Northern Lights there literally from our log cabin. You can’t ask for better than that! Let us know if you need suggestions once you start planning your trip. The baths are definitely a great way to spend a relaxing evening, Wibi. The price really isn’t much. Thanks for this insight. I esp love those photos taken at the blue hour. Thanks, Andreas! The blue hour was especially pretty that day. Ooo, this will go on my list for the next time I’m in Iceland! I loved the Blue Lagoon more than I expected to, so more thermal spas will definitely be on my to-do list from now on when I travel. Also, I love the fact that Iceland even reuses its power plant water to help promote tourism! So smart of them. Amanda, you should also check out Grjotagja thermal spring. It’s a natural lava cave that the locals still bathe in. I wrote a post about our experience there. Definitely adventurous! Nice one…I’ve only ever heard of the Blue Lagoon until now. Even more so if the Aurora makes an appearance! It’s funny. Tim kept asking what there is to do in North Iceland when we were first planning this trip. And in the end, we didn’t see it all and loved our time in the north! Fantastic, Esther! Where were you volunteering? Hi Jennifer, sorry for the late response, I volunteered with SEEDS Iceland in six different locations around the island 🙂 Akurery, Kirkubaejarklaustur, myvatn… (can’t write the names, lol). That’s fantastic, Esther! Sounds like you really got to see a lot of Iceland. It’s really only a few seconds that you are outside at the Nature Baths. And you can even wear a robe and flip flops out and back in. Next week we have a post coming about snorkeling in Iceland. Coldest thing I’ve ever done in my entire life! Good morning! I LOVED all your posts about Iceland. I am in the middle of planning a trip for my husband and I in May. Thank you for the info on “Secrets of the South” and the 112 Iceland App. I also grew up in Durango, Colorado so it is great to see it on your Romantic Getaway list. I would love to hear any other quirks or must sees in Iceland. Thank you! Hi Tiffany! Thanks for your kind comment! You will absolutely love Iceland. We’re just now writing about our latest trip there in which we spent nearly a month just researching off-the-beaten-tourist-path things to add to our Iceland information. Coming still is the Westman Islands, Westfjords, and East Iceland. So stay tuned! We really enjoyed Durango and actually spent our anniversary there, so it’s definitely a romantic destination in our book. 🙂 We’d love to go back now that we ski and of course explore more of Colorado. What a gorgeous place you grew up in!